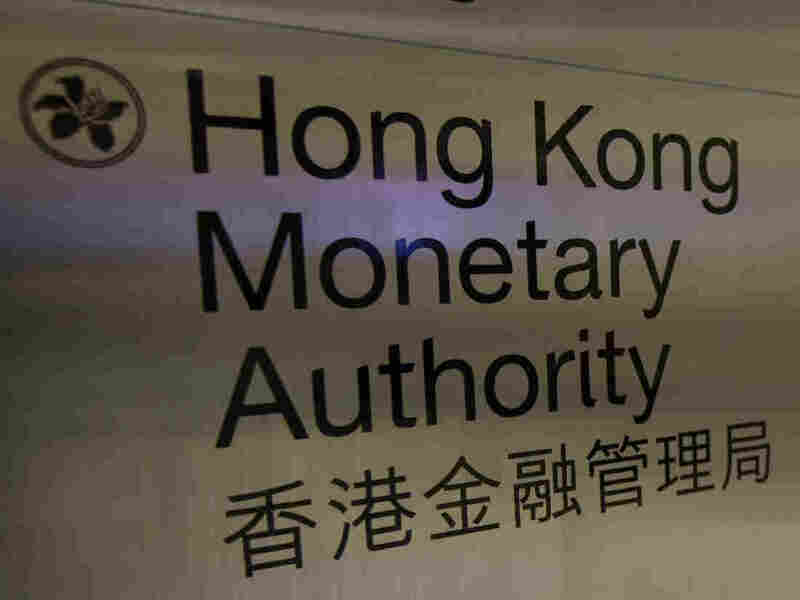 Hong Kong Says UBS Tried To Rig Interbank Lending Rate : The Two-Way UBS, which was fined for manipulating the Libor rate in 2012, was censured by the Hong Kong Monetary Authority, the territory's de facto central bank. A directory board of Hong Kong Monetary Authority in Hong Kong. The territory's de facto central bank said evidence shows UBS tried to manipulate the interbank lending rate. UBS, which was fined $1.5 billion in 2012 for what regulators said was "routine and widespread" rigging of the London interbank offered rate, or Libor, has been censured for trying to do the same thing with Hong Kong's benchmark rate between 2006 and 2009. The Hong Kong Monetary Authority, the Chinese territory's de facto central bank, says as part of a lengthy investigation, it "found 100 chat messages in which UBS traders made requests to make submissions at a certain level. However, it added that the requests had had no impact on the setting of rates," The Financial Times reports. "Hong Kong launched an investigation into potential rigging of Hibor in 2013 at the height of the scandal over banks' manipulation of the London interbank and other global rates, which govern the returns of more than $350tn of fixed income and derivative products. "The Hong Kong Monetary Authority said it had examined more than 31m messages from nine banks involved in the fixing of Hibor between 2005 and 2012." " 'The HKMA found evidence of misconduct in the submission of Hibor rates by only one bank, and no evidence of collusion between these banks to rig the Hibor fixing,' it said." UBS, which has not been a part of the Hibor fixing panel since 2010, said in a statement that it was "pleased that the investigation of the HKMA returned the same results as our own internal investigation — no collusion among banks and no noticeable impact on the fixing of Hibor." As we reported in December 2012, UBS was fined $1.5 billion for manipulating the London rate. That was the same month HKMA launched its investigation into efforts to do the same with the Hibor. There have also been crackdowns by banks in Japan and Singapore. "[To] prepare a plan to address the 'control and governance weaknesses' within six months and to submit a report from an external auditor on the effectiveness of the plan."